Mitsubishi L200 ’04 Alternator Replacement – The Quick Way! A friend with a 2004 Mitsubishi L200 Warrior recently noticed the dashboard red charge (Battery) light fail to come on under any circumstance, including the ignition position, when every lamp should light as a ‘bulb check’, signalled time to investigate. He had also noticed the charge rate had fallen to about the 12 volt position on the battery gauge, where normally it would have been closer to the 14 volt position. We checked the charge output and it was around 11 volts at the battery – not good! I also checked that the exciter voltages were present at the disconnected alternator plug. One of the spades in the loom plug measures battery voltage constantly, the other only has supply when the ignition is on. Make sure you check you have these supplies present before venturing to change the alternator, as without these voltages presenting themselves at these terminals you will likely have no charge output from the alternator. In our case the voltages were correct, no or low output and no charge lamp – diagnosis, faulty alternator. 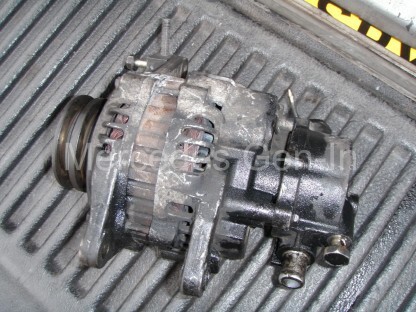 We were fortunate to have a complete known good, used alternator to hand so I began the task. It was only after doing the job and discovering this was not perhaps the most straight forward job, that I began to read how others had tackled it, and to be honest was a bit little surprised at the work people had made for themselves while doing this job. So here is the Mercedes Gen-In method! Remove the battery negative terminal. Take out the air filter box and disconnect only the first 90 degree section of induction hose out from it. Use slip pliers and compress the coolant hose clip at the thermostat housing and slide it back down the hose 2 or 3 inches. 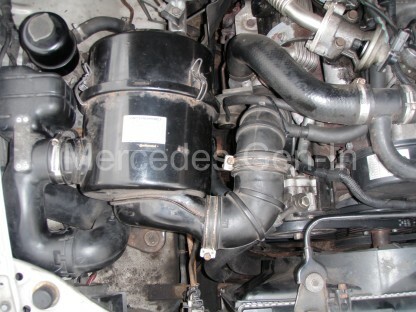 Pull off the coolant hose and tuck it at the front just behind the fan cowl and power steering belt. 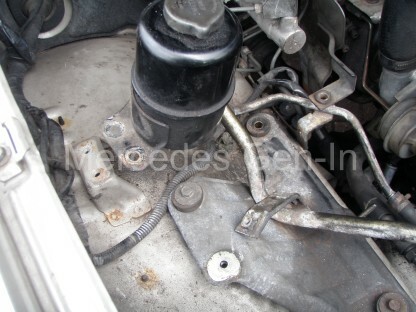 Undo the two fixings on the bracket to the power steering reserve and follow the two connected rigid steel pipes to a bracket that also holds the front edge of the turbo heat shield. Remove the upper and lower 10mm pins from this bracket, the lower one is a little restricted but can be done with little fuss. The PS reserve and its pipework, right to the power steering pump, can now be moved around quite freely. Take off the alternator belt tension adjustment block, pulling upward on the alternator drive belts to draw it tight into the engine block then slip off the belts from the pulley. Now follow the steel slotted tensioner bracket back to the engine block. You will find a single 12mm pin, unscrew this several turns to a point where you can get it past the front of the alternator pulley and let it hang vertically down parallel to the block. Reach down with a spanner and remove the thick charge wire eyelet from the pin at the rear of the alternator, squeeze in the clip at the back edge of the two pole electrical connector on the alternator body and pull that out. 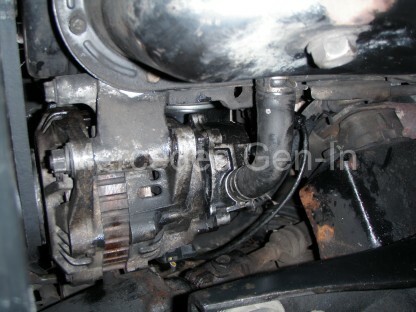 Now swing under the front of the vehicle and locate the oil pressure sensor which is just behind the alternator/vac pump body, once you have found this pull off the single spade terminal and withdraw this wire along with the main alternator and exciter wiring, up into the engine compartment out of the way. You may have to release the holding clip to the loom at the thermostat housing to fully clear the wiring from the work area. While in the engine bay, squeeze the pipe clip that holds the vacuum hose onto the rear spigot of the alternator mounted pump. Pull off the pipe. Get underneath the vehicle and fully remove the short L shaped hose for the oil return that goes from the vac pump to the sump. Using a 17mm socket wrench, undo the oil supply banjo bolt from the vac pump body – be sure to recover the two copper washers either side of the union as you will need these later. Be aware that you will lose about half a cup full of engine oil once this pipe is removed. This in itself is not an issue as it can be adequatley collected and controlled by soaking onto a rag, but you will need to be prepared for it or you will get covered! 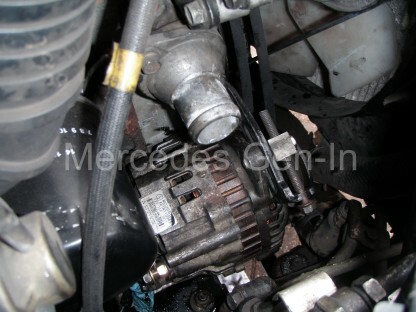 While this is draining, undo the lower alternator pivot bolt and tap it through towards the back of the vehicle. From above the vehicle, work the alternator out of the bottom pivot bracket and orientate it vertically so the adjuster bolt flange is at the 2 o’clock position, standing over the off side wing looking in (UK Vehicles). This part of the flange will need to be up as near to the radiator cowl as possible. 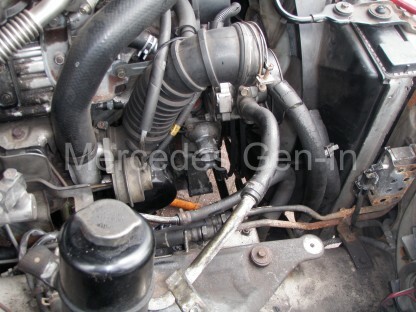 Now work out the alternator through the supply pipes to the power steering pump by manouvering them as needed. 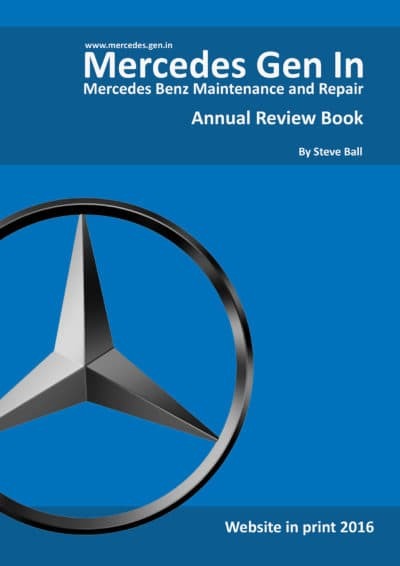 The alternator will now lift out of the engine compartment, there is more than enough flex in all the connected pipework to guide the alternator through without problem – just take your time. If you have a new alternator you can now simply transfer the vac pump section to the replacement unit (three 10mm pins, sliding the pump off/onto the splines of the alternator rear shaft) Making sure you still have the bung fitted to the small vac take-off pipe, next to the main larger vacuum spigot, as this can sometimes get knocked off in the removal / refitting process. Refitting is again the reverse of removal. The amount of water lost during this operation is no more than half a litre and remember to check your oil level before restarting. Once you have fully connected up the alternator and vac pump, put back the minimum of components and tension the belts correctly to test your work. This job took just over an hour from start to finish and went really well, I have read of people removing oil filters, power steering pumps, all belts… Totally unnecessary if you have this engine configuration. Have fun! Many thanks for detailed L200 removal and refit. The only extra job I had to do was re-shape the tension arm bracket reshaping a more prononced curve as the new alternatore was 4mm thicker and conflicted with ajuster. Dingbro supplied 65 amp Bosch Alternator. That is great news, I am glad it went well. Its nice to get good feedback and thanks from time to time. High possibility of it being a faulty regulator pack or badly slipping belts.